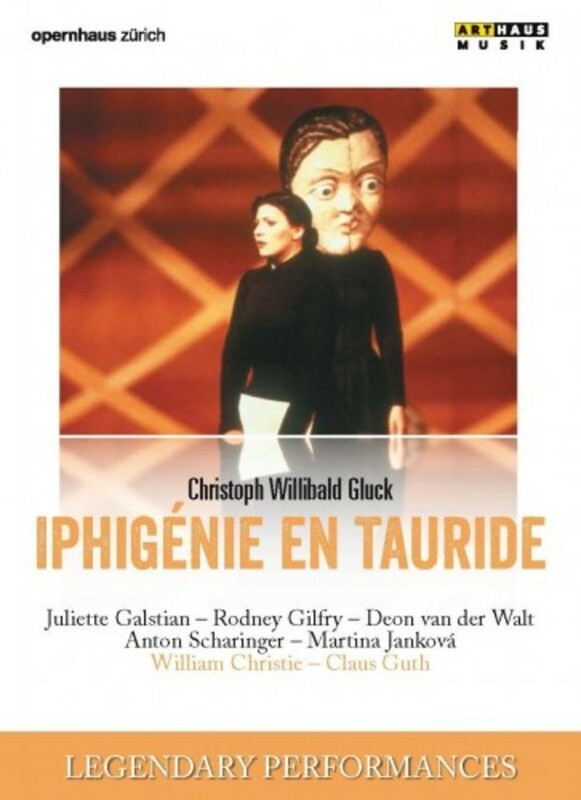 Gluck’s wonderful but neglected 1774 opera Iphigénie en Tauride, inspired by the Greek legend, is treated with forceful and convincing simplicity in Claus Guth’s revolutionary production staged at the Zurich Opera House. The psychological drama in a tense atmosphere of fears and traumas is underlined by Guth’s use of huge masks and enclosed spaces. Conductor William Christie and his typically transparent but never cold orchestral sound perfectly match the descriptive elements in Gluck’s score, while the Armenian mezzosoprano Juliette Galstian as a fabulously good Iphigénie, the leading American opera baritone Rodney Gilfry as Oreste and the late South African tenor Deon van der Walt as Pylade head a superb cast. by Mozart, Gluck, Weber, Puccini and Rossini, as well as Janáček’s, Berg’s and Poulenc’s more recent operatic strokes of genius, performed by singers like Peter Schreier, Ileana Cotrubaș, Franz Grundheber, Edita Gruberová, Peter Seiffert, Inga Nielsen, Marilyn Horne or Malin Hartelius; and last but not least virtuously conducted by international stars like Claudio Abbado, Riccardo Muti, Fabio Biondi, Sir Charles Mackerras or Nikolaus Harnoncourt. Legendary Performances impressively demonstrate how diverse, imposing, and especially how alluring and delightful the world of opera is.